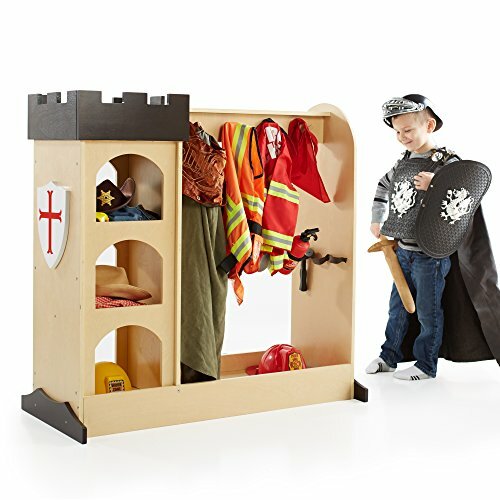 This wooden castle dramatic play storage unit is a wonderful way for your little Knight in shining armor to enjoy organizing his favorite costumes and dress up clothes. This sturdy piece features a full-length mirror plus three compartments next to the clothes rack with additional storage at the top of the tower. Eight hooks offer plenty of room for costumes and clothes. Nylon straps are perfect for keeping swords, wands and other dramatic play accessories together dimensions: 43"h x 42"W x 20"D. Some assembly required.